It is headlines like these that strike fear in our hearts. Data leakage is not an annoying thing anymore — like when a salesperson might take a customer phone number list or maybe a manual. Now employees and hackers alike can access the whole list, trading history, financial contracts, emails, phone numbers, product blueprint, credit card information, customer data, competitive analysis, product documentation—the list goes on. Information leakage is one of the most pressing problems for government organizations, startups and established business alike. It poses a threat especially if the documents you have are of a sensitive nature (blueprints, credit card information, customer data, trade secrets, financial statements, etc.) Oftentimes, the enemy is within the walls of the company. However, in some cases, breaches occur when a third-party provider is involved, allowing the leakage of sensitive data. Rank all business processes involving the flow of data outside the organization according to the level of risk posed to identify threats. Define security policies for all types of documents. Provide a two-factor authentication to protect against password theft. Any business today run a high risk of exposure through data leakage. There are several ways to keep your business data protected and secured. There are some steps to it. First, businesses must recognize own critical data. They must be able to identify it and be able to classify it according to its criticality. Businesses must know how to utilize data loss prevention software (DLP Software) to protect any sensitive information. Depending on the industry, this could be blueprints, credit card information, customer data, trade secrets, financial statements, etc. A thing to note — DLP software relies heavily on proper organization of data. Businesses should have a data protection strategy in place, mainly targeting sensitive documents and the way they are handled. Data leakage prevention best practices should be discussed well before the inception of the business itself — that’s how important data prevention strategy is. The next step in preventing data leakage is to closely monitor it. Have information on who has access to it. Monitor traffic on all networks. The average hacker investigates and explores a network for six months before actually penetrating the system and causing a breach. Hence, you need to identify unusual behavior before a breach occurs. There are several monitoring tools and software available which supervise access and activity, notifying overseers of any red flags, for instance, when an employee or a third-party person downloads, copies or deletes vital information. A Data Activity Monitoring (DAM) software can come to the rescue. This tool provides another layer of protection over the DLP software by detecting unauthorized activities. While a DLP software primarily focuses on network and endpoints, the DAM’s focal point is database activity. Using a combination of both the tools provides for a broader spectrum of protection. Consider encrypting any sensitive or confidential information. Encryption is a way to prevent data theft, which consists of converting data into a code to prevent unauthorized access. While this is not a totally foolproof solution, digital encryption remains one of the best data leakage prevention solution to this day. A carefully executed encryption system renders stolen data unintelligible and scrambled. Now that you have implemented data loss prevention program, added another layer of protection in the way of data activity monitoring and encryption, what about the sensitive data that is transferred onto a pen drive and made available for others to access? It is then that it goes outside of the control of IT — which is where DRM comes in. DRM or Digital Rights Management is a combination of license and access controls and encryption that protects your data. With DRM in force, you can implement access policies to restrict viewing, copying or printing of documents and eBooks. DRM techniques include controlled access to digital matter, copyright, and public domain content. It also includes encryption and embedding. DRM tools can be used for data leakage protection. A DRM system provides control over information that has been distributed, regardless of where it is located or the kind of medium it is stored on. This software prevents unauthorized users from having access, even if they happen to obtain both protected files and authorizing information. Another essential use of DRM is the prevention of copying and printing. If you must allow printing, then you can limit the number of copies made. This solution also provides watermarking that is difficult to remove — and that identifies who and where the source of the copy is. 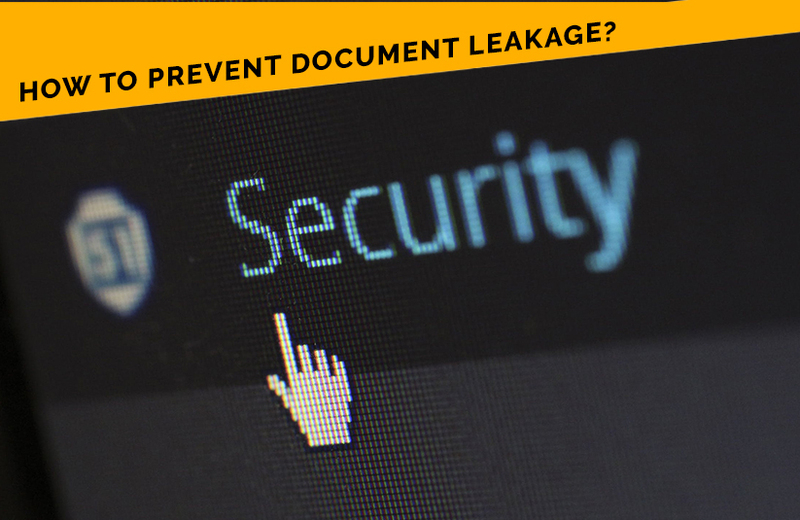 So, one of the most effective ways of significantly reducing sensitive data leakage is to apply a DRM enforcement system over the documents that you need to control—typically those containing sensitive information. This system is an easier way for businesses to protect important documents so that your administration effort is greatly reduced as much as possible. If you discover a data leak or a laptop containing sensitive information is lost or stolen, a DRM control system should allow you to switch off approved users at a short notice. In other words, you are in effective control of your information and preventing data leakage from within. All that said, any kind of security cannot be total and absolute. Security software is continually evolving and closing the gaps in its systems. Following best practices for data protection and having a contingency plan in place makes good business sense. Companies are at risk if they simply believe their documents are safe and that nobody can access it, all because the data hasn’t left the confines of the company. Remember, if sensitive documents become available to the public, the business loses the trust of all customers and its reputation is damaged beyond repair. This could easily lead to legal issues, loss of revenue, and decreased market share. If you need help on how to prevent your data, then there are management consulting firms who could help you come up with the best data leakage prevention policy system for your business. Ourbusinessladder is a business development consultant and one of the top Management Consulting Firms in India. We are the one stop solution for existing businesses and enterprising entrepreneurs.